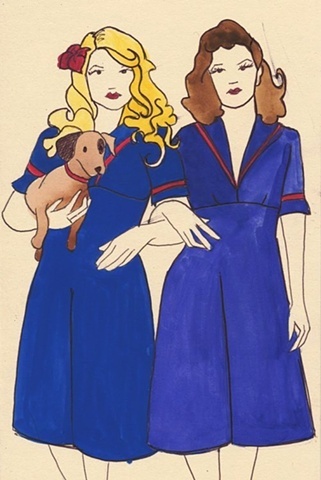 A small sketch of two girls wearing matching blue vintage dresses. The blonde girl is carrying a little sausage dog. This was just a fun little sketch, something I painted on a rainy Sunday afternoon- and your opportunity to own a little piece of art. The image is on a piece of mountboard, so it's really rigid and can be display on a shelf unframed.